Staff at the National Institute for Health Research Surgical Reconstruction and Microbiology Research Centre (NIHR SRMRC) teamed up with the Critical Care team at QEHB and QEHB Charity to take on the 25-mile trek on Saturday, June 6. The team was joined by former QEHB patients Karl Hinett, who suffered severe burns after being involved in a petrol bomb explosion whilst serving the military in Iraq, and Rory Curtis, a member of the NIHR SRMRC Patient and Public Involvement Group. Their efforts were rewarded with the news that the challenge has helped to raise more £1,000 for trauma research. Sister Aisling Clarkson, senior trauma research nurse in the SRMRC, led the group, who faced winds of up to 50 miles per hour throughout the 13 hour hike. 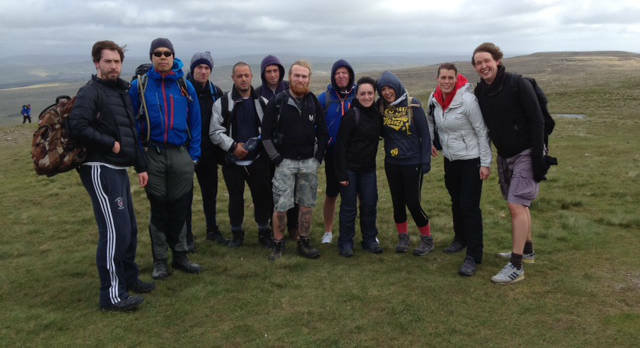 “Completing the trek was extremely challenging due to the adverse weather conditions. Every time we thought we couldn’t go on we kept reminding ourselves why we were out there, and that every step we took would help us raise money for research into the care of future trauma patients at QEHB. The team plan to continue their fundraising efforts over the coming months, starting with a charity head shaving event in partnership with qualified Barber and former SRMRC research participant Rory Curtis. All proceeds from the Yorkshire Dales Three Peaks Challenge and future fundraising events will go into QEHB Charity’s Trauma Research Fund, which has been founded specifically to support the SRMRC’s innovative research. Justine Davy, head of fundraising, said, “We are proud to collaborate with the SRMRC, whose research investigates novel methods for treating trauma patients from the point of injury through to post-hospital care. If you would like to support the team and donate to the QEHB Charity Trauma Research Fund please visit https://www.justgiving.com/nihr-srmrc-researchteam/. For more information about the NIHR SRMRC visit www.srmrc.nihr.ac.uk.